You need smoked pork chops in your life. I have a thing for really thick pork chops. 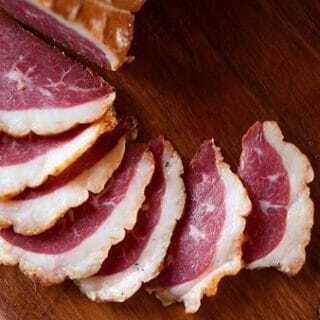 It’s one of the few farmed meats I miss, and I almost always order them when I see them on a restaurant menu. So I decided to do something about it. My friends Christian and Kate of Ham Sweet Farm in Michigan raise really good hogs of all varieties. including ossabaw crosses. Ossabaw is a classic Southern pig that lays on a fair bit of fat. They had a hog available, and shipping was surprisingly cheap, so I bought one. I asked for real pork chops. No less than two fingers thick, and ideally three. Double bone chops. 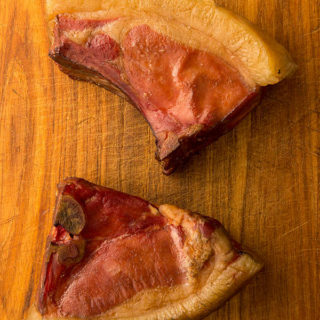 Chops that make you shout, “America!” This is what you want for smoked pork chops. Keep in mind this is a recipe for smoked pork chops, not barbecued pork chops. That’s another recipe. This is a straight up smoke, no sauce. And it… is… amazing. See all that fat? First off, it’s so unsaturated that when you eat some, the heat of your mouth melts it. So good. Second, what you don’t feel like eating, you put in a pan to render. If you have never cooked with smoked lard, your life is incomplete. Trust me on this one. 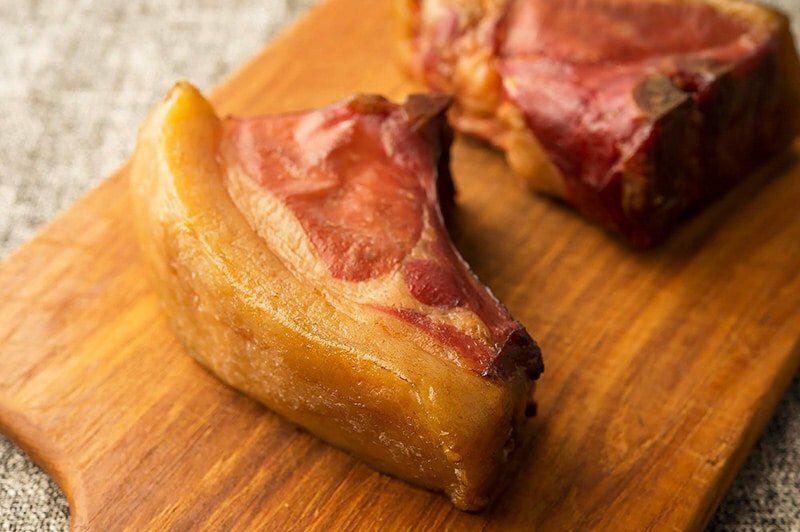 As for how to eat your smoked pork chops, you can simply eat them for dinner right out of the smoker, or you can let them cool and slice off bits to eat as a knee-buckling snack. No mustard needed, although I won’t think ill of you if you do. And do not toss the bones! They are too good for your dog. Even if you have a very good dog. Use the smoked bones to make a quick stock to cook beans in, or collard greens. You’re welcome. Can you make smoked pork chops with thin pork chops? Yeah, I suppose. But they won’t be as nice. Also, you need the curing salt to get the full effect. The chops get a little hammy, and stay a rosy pink. You can of course skip it. You will get a grayer meat, though, more porky and less hammy. Both are good, but I prefer a fully cured smoked pork chop. but anything that can measure to 1 gram works. This recipe is designed for domestic pork, but you can of course use wild hog chops, too. I just like the extra fat I get with farmed pigs. You can scale this recipe up if you'd like. Weigh your pork chops in grams. Yes, you need a scale for this recipe because I have no idea how heavy or thick or large your chops are. Once you have your weight, measure out 1.25% of that weight in grams of sea salt, or kosher salt. Now measure out 0.25% - that's one-quarter of one percent - in curing salt if using. If you are not using curing salt, sub in more regular salt. Mix the salts and the sugar, if using, together and massage that into the pork. Ideally, you then vacuum seal the pork. If you don't have a vacuum sealer, put the pork chops in heavy freezer bags. Set them in the fridge to cure. You will need to cure these chops for a minimum of 2 days, and for chops as thick as mine, up to a week. Don't worry, this method of salting them prevents the pork from every getting too salty. You can leave the chops in there for 10 days if you wanted. When you are ready, get the smoker going. Any wood you like works, but I prefer apple or cherry. Rinse the pork chops in cold water and pat dry. You want them still damp. Smoke at 200F for at least 4 hours. You want them to be fully cooked inside, about 150F to 160F. Serve hot or cold. NOTE: Recipe time does not include cure time. You can find all sorts of smoker recipes for meat and fish here on Hunter Angler Gardener Cook! David: With this method of curing it’s not needed, because there is no excess salt to remove. But you can if you really want to. Lol! I think every home cook who cures meat uses the same exact scale. Digging Dog Farms has a great cure calculator. I need to go looking for heritage pork products. Hi there again from Australia mate! I think I’ll have to give this a run in the treager. Need some big pork chops but. I have a friend whose property I hunt bunnies on and they grow pigs so I you have inspired me to give them a call and see if I can buy a pig, head out for a weekend and butcher it. I can cut the chops as thick as I like then! I have some uncured, unsmoked thick ham steaks. about 1600 grams of meat in one steak. Curing now. Looking forward to the smoking and eating next Sunday.